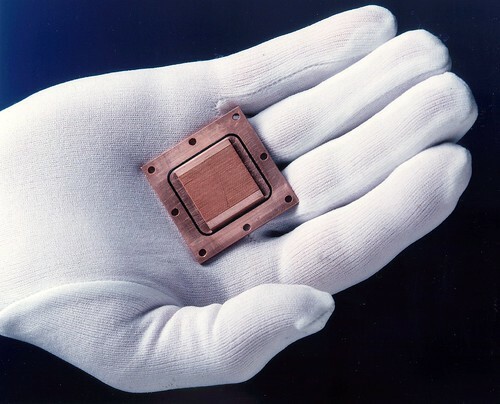 PNNL has developed a variety of microchannel devices for compact chemical and thermal systems. The rapid heat and mass transport provided by microchannel devices results in their small size and high efficiency. As part of RAPID, these systems can be designed for affordable commercial production so chemical companies can use them in their manufacturing operations. RICHLAND, Wash. — Getting more production output from a chemical operation or performing the same process more efficiently in a much smaller footprint could save U.S. manufacturers billions of dollars and create new jobs. It's known as process intensification and two Northwest institutions are part of the team that's been tapped to make it happen. The Department of Energy's Pacific Northwest National Laboratory and Oregon State University are part of the newest institute under the Manufacturing USA Initiative. DOE recently announced that the American Institute of Chemical Engineers will lead the institute, named Rapid Advancement in Process Intensification Deployment. The RAPID institute will focus on finding breakthrough technologies to improve efficiency and productivity in industries manufacturing products such as oil and gas, pulp and paper, and chemicals. These improved technologies have the potential to save more than $9 billion annually in process costs. PNNL and OSU will co-lead the Module and Component Manufacturing Focus Area for the institute, leveraging years of collective experience in process intensification technology development. This collaboration includes the Microproducts Breakthrough Institute in Corvallis, Ore., which has been active since 2003 in the commercialization of microchannel-based technologies for process intensification. "The goal is to advance lower-cost process intensification equipment in partnerships with chemical equipment suppliers who are involved with RAPID," said Ward TeGrotenhuis, senior research engineer at PNNL and RAPID focus area co-leader. The PNNL/OSU team will redesign and ready a wide variety of devices for commercial production. The technologies could come from any of the 75 companies, 34 academic intuitions, seven national laboratories and other organizations from across the country that make up the RAPID Manufacturing Institute. PNNL also leads the Northwest Regional Manufacturing Center — a related effort focused on smart manufacturing. OSU is also part of the Northwest team for that Institute as well. The RAPID institute leverages up to $70 million in federal funding from DOE's Office of Energy Efficiency and Renewable Energy over five years, subject to appropriations, combined with more than $70 million in private cost-share commitments from the Institute partners.